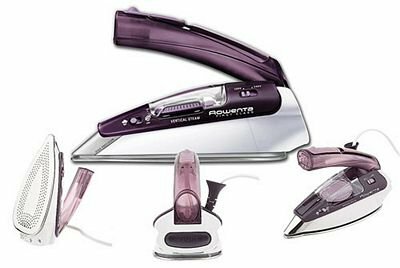 This compact iron is a high performance iron that performs traditional ironing tasks with ease. It is ideal for crafting, quilting, and travel. Features include: A Microsteam Stainless Steel Soleplate that allows for superior glide and temperature distribution; Burst of Steam: provides a powerful burst that is both vertical & constant at a steady rate; True Dual Voltage:two heating elements ensure the iron is as powerful at 120 volts as it is at 240 volts; Full range thermostat; Water tank capacity 2.4 oz; A handle that folds flat for storage; Includes a travel pouch.